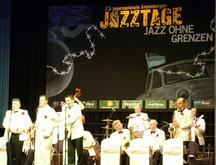 A highlight of this tour was the Orchestra's appearance at the Jazz festival in Sonneberg. The theme of the festival was "Jazz without frontiers" recalling the fact that the border had been only a few hundred meters from the town. The Orchestra wowed the packed venue and was rewarded with standing ovations from the audience. The lovely historical cities of Erfurt and Halle were further stops on this tour.